I distinctly remember some of the press that came out around the release of Foo Fighters’ debut album in 1995. While most of it was positive and optimistic, there was a certain faction of reviews that were dripping with a condescending tone of “how nice to see Dave Grohl trying to cope by starting a new band.” While music fans were still reeling from the death of Kurt Cobain, journalists were trying to gauge what Nirvana’s remaining members would do. Dave Grohl had already been learning guitar and writing his own songs while Nirvana was still together, even putting together a project called Pocketwatch under the name Late! in the early 90’s. Understandably, he has said he felt too intimated to really bring much of his stuff up to his band mates though. 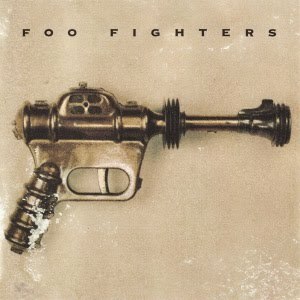 Once Cobain’s death brought a startling halt to Nirvana, Grohl decided to record a full album of his songs. Grohl played and sang every note on the album except for one guitar solo by The Afghan Whigs’ Greg Dulli on “X-Static.” Not wanting to put out an album under his own name, Grohl released it as Foo Fighters in 1995. To tour behind it, he selected some big guns from other defunct bands; Pat Smear from The Germs and Nirvana, and William Goldsmith and Nate Mendel from Sunny Day Real Estate. Being fifteen and the prototypical Nirvana fan, I was ridiculously looking forward to this album coming out. Thanks to my hefty Kroger bag boy paychecks, I was able to buy it the day it hit stores. For some unknown reason, I picked it up before my shift and therefore had to carry it around in the pocket of my khaki shorts the whole time I was shlepping groceries and trying to keep old ladies from putting dollar bills in my pockets for tips. Although I was super careful and it made it home uncracked, it was still not one of my brightest decisions. “This Is A Call” had been on the radio for a few weeks already and I still remember my exact thoughts when I heard it for the first time. I thought it had mind-blowingly awesome music but really dumb lyrics. No offense, Dave! He’s really written some absolutely amazing lyrics since then and even some of the other songs on the album were great, but when I heard “Them balloons are pretty big and say they should ever fall to the ground call a magic marker” I was slightly confused to say the least. I’ve mentioned before that I’m a big lyrics guy and I’m all for creative imagery and poetic representations, but what does “Venison is pretty, venison is good, seems that all the cysts and mollusks tend to barter” actually mean? But who am I kidding? Dave gets a pass because the song absolutely rocks! The guitar riffs are some of the best to come out during that time and the drumming is just as powerful as anything he did in Nirvana. 15 years later this song still gets me going and even though I may quibble at the lyrics, I still sing along at the top of my lungs every time.